This graffiti has been a fixture in the Kenton neighborhood for years. It can be found on a building that looks more commercial than residential but it does not appear to be a business. The first time I saw it I considered old Buddy Holly and I agreed. He lives. Holly died young on that fateful early February night fifty-eight years ago and left a lasting legacy. This is a tale of graffiti with a few revisions. The original wasn’t something I bothered to document. Fortunately neighborhood instagrammer and raconteur, Graham Marks, had taken a picture. 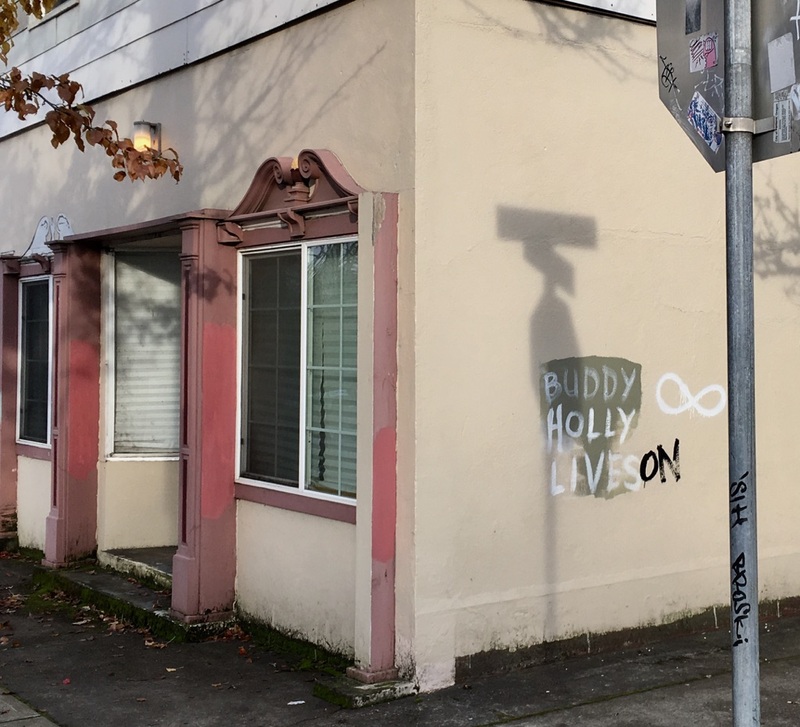 “Buddy Holly Lives,” it said until someone added the word “on.” Now Buddy Holly Lives on. In the time I spent working in a group home I had a routine with one of the clients. We played music while I helped him get dressed for work. We wore out his slim cd collection. Then I discovered the weirdly reasonable selection of cds for sale at Rite Aid. There was a cd of Bruce Springsteen demos, some Dylan, Aerosmith, Willie Nelson and Meat Loaf. We passed on his greatest hits as too bombastic for a group home. When I saw a Buddy Holly cd it was my client’s era and gave me a chance to get past the hiccuped hits and delve deep into his discography. Weeks after that shopping excursion a Rite Aid employee oddly enough was trying to push a Buddy Holly recording on me. I may have been standing near the cd section. I fought off any need to discuss my interactions with Buddy Holly’s back catalogue. I was avoiding “mansplaining” before I even knew that was a thing. The idea of having a cultural interaction with someone at a drugstore, however brief, was something I appreciated though. 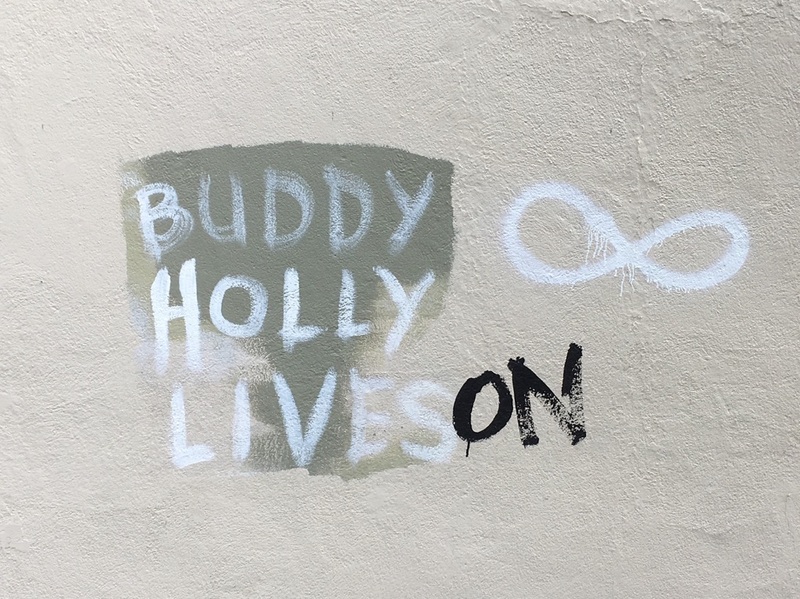 Sometime later, an infinity sign was added to the Buddy Holly memorial wall. Someone must have felt this was necessary. Perhaps it was a certain Rite Aid employee. I would like to think that Holly’s music will be appreciated as long as recorded music exists. Infinity, I don’t know about. That’s forever. We still kind of remember Virgil the Poet although I’m not sure he had any “Top XL” hits. I’d like to imagine someone will be googling Holly two thousand years from now. Buddy Holly was an iconoclast who won’t be forgotten soon. His death being referred to as “the day the music died” is proof of his impact on rock music history and his influence on The Beatles is also notable. Sadly he didn’t make the cut on that gold plated disc NASA sent into space. Chuck Berry somehow seemed like a better representative of early rock. He missed out on an intergalactic audience but there’s bound to be a bronze statue in Lubbock. 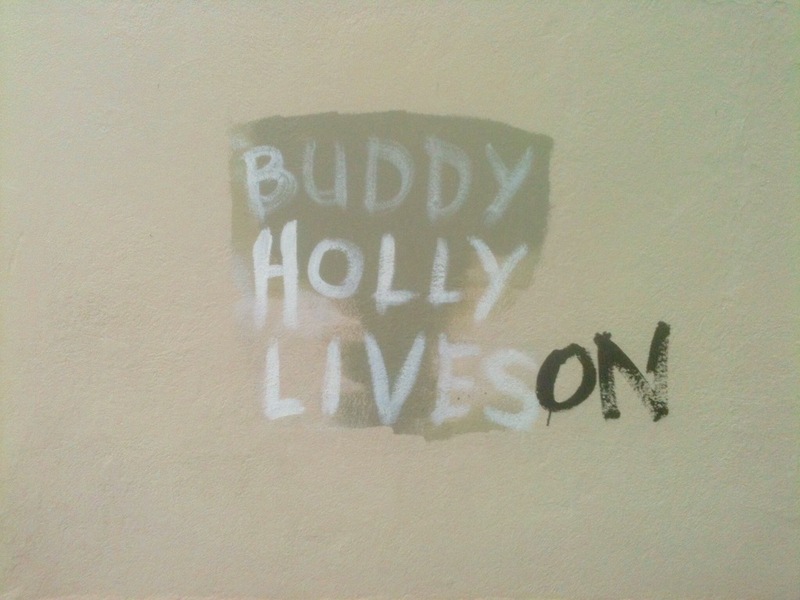 And here in Kenton a spray painted slogan reminds the world not to forget the spirit of Buddy Holly. Next week’s message will be an Auto Message.